Do I Need to Worry About Charging ? Will the Tesla Model S go the Distance ? 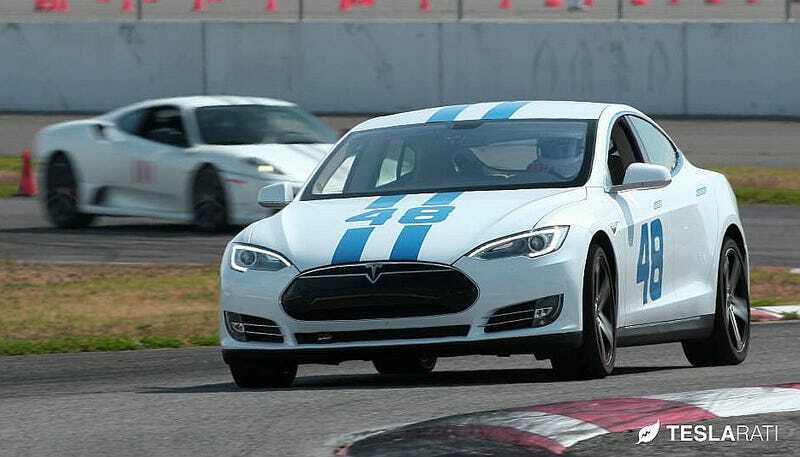 The Model S is not built for racing. It overheats after one lap of hard performance driving. When that happens, power limitation kicks in to protect the car. A yellow dashed line on the power consumption gauge appears on the dashboard. The longer you go, the more severe power limitation gets. It’s a great safety feature as it lets you push the car as hard as you want without having to worry about car damage. However this same protection mechanism has a drastic impact on the overall racing experience. You can start off as being one of fastest cars on the track on your first lap, to becoming the slowest car on the track in the subsequent laps. 50 miles of hard driving per charge doesn’t sound all that bad, especially if tracks start adopting quick chargers. My FocuST averages ~10mpg on the track, and due to the saddle bag design of the tank, I won’t drive with less than a quarter tank due to possible fuel starvation issues. That comes out to about 70 miles of track driving per full tank. Give it a few years, and I’m sure the battery capacity will meet it. However, the fact that they overheat quickly is a little disconcerting. Granted, stock cars can’t cope with the stresses of track duty, but at least with conventional internal combustion engined cars you can upgrade radiators/cooling etc pretty easily. that the cooling system is a quite complex sealed refrigerant system. Eh, maybe I’ll just save up for a used 911.